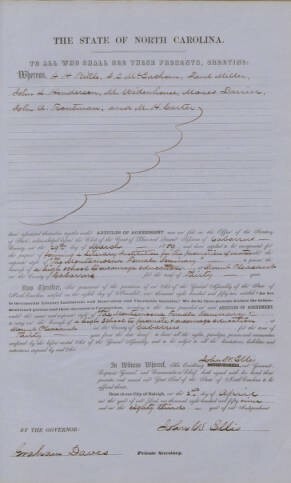 Mont Amoena Charter, April 2, 1859. Charter for Mont Amoena Female Seminary in Mount Pleasant, North Carolina. Also known as Mount Pleasant Female Seminary. The SA of NC considers this item in the public domain by U.S. law but responsibility for permissions rests with researchers. have associated themselves together under ARTICLES OF AGREEMENT now on file in the Office of the Secretary of the State, acknowledged before the Clerk of the Court of Pleas and Quarter Sessions of Cabarrus County, on the 29th day of March, 1859, and have applied to be incorporated for the purpose of forming a Literary Institution for the promotion of education under the corporate style of “The Montamoena Female Seminary” to pursue the business of a high school to encourage education at Mount Pleasant in the County of Cabarrus, for the term of Thirty years. Now Therefore, In pursuance of the provisions of an Act of the General Assembly of the State of North Carolina, ratified on the eighth day of November, one thousand eight hundred and fifty-two, entitled ” An Act to incorporate Literary Institutions and Benevolent and Charitable Societies,” We do by these presents declare the before-mentioned persons and their successors a Corporation, according to the terms prescribed in said ARTICLES OF AGREEMENT, under the name and corporate style of “The Montamoena Female Seminary” to carry on the business of a high school to promote & encourage education, at Mount Pleasant, in the County of Cabarrus, for the term of Thirty years from the date hereof: to have all the rights, privileges, powers and immunities conferred by the before recited Act of the General Assembly, and to be subject to all the limitations, liabilities and restrictions imposed by said Act. In Witness Whereof, His Excellency John W. Ellis, our Governor, Captain-General, and Commander in Chief, hath signed with his hand these presents, and caused our Great Seal of the State of North Carolina to be affixed thereto. Done at our City of Raleigh, on the 2nd day of April, in the year of our Lord, one thousand eight hundred and fifty nine, and in the eighty third year of our Independence. This entry was posted in 1850s, Cultural History, Document and tagged 1850s, Cultural History, Document. Bookmark the permalink.